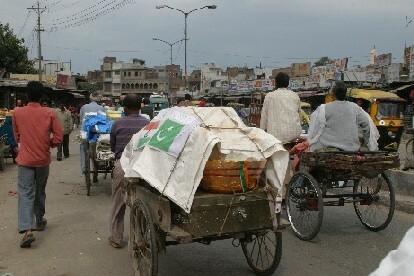 Our first day of walking, through city streets filled with cycle rickshaws carrying school children, horse carts loaded with onions, and cars, buses and trucks, ended in Khasa, a locality with two blocks of commerce, at the edge of which stood M/S Kissan Auto Agency. Our team spent the night above the garage with the family of Mr. Inderjeet Singh who, along with his wife, never stopped working to make our stay comfortable. 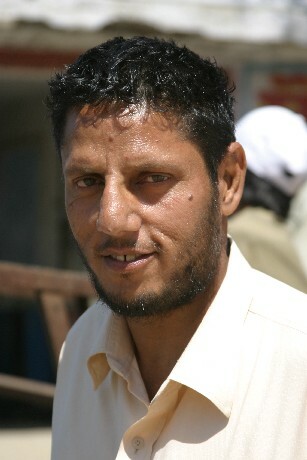 By the next morning, the Indian-style (squat) toilet was useable, and he and his wife made and served aloo ka paratha, butter, curd, and tea to our five drivers and expediters, 6 cycle cart walas, and the 10 of us who were walking to the border. The second day’s walk was really pleasant, past fields and fields of wheat. Two different media crews caught up with us at various points along the way, and every single policeman or border patrol stationed along the road seemed to know who we were. We reached the border in time catch most of the closing ceremony, a depressing piece of theatre described by Mark in his post, Symmetry and Dissymmetry. Mark also describes our crossing in the same post, two days later than planned, because of the delay in our visa approvals. On April 13, 1919, British officers ordered the massacre of an unarmed gathering of people in Jallianwala Bagh, Amritsar, killing at least 379 men, women, and children. (Unofficial records put the number at over 1,000.) The massacre galvanized the freedom movement in Punjab against British rule and paved the way for Gandhiji’s Non Cooperation Movement against the British in 1920. The Friends Without Borders team chose to hold a small, simple event at Jallianwala Bagh in memory of the dead and to start off our journey of friendship to Pakistan. Students from 14 schools gathered around a circle of 6’X6′ school tarps to sign their names and write messages of friendship. 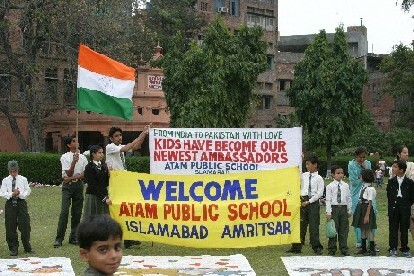 Atam Public School arrived with banners made in less than one day: From India to Pakistan With Love, KIDS HAVE BECOME OUR NEWEST AMBASSADORS. 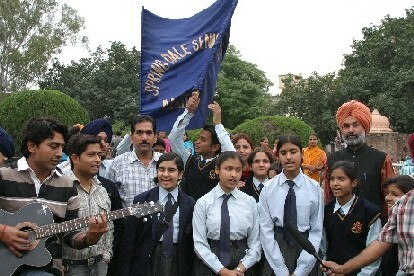 The students of Spring Dale Senior School sang songs of friendship and children read their letters out loud until power cuts in the city rendered our public address system useless. A little bit before dark, we passed out candles. John lit his candle from the eternal flame and used it to light all the other candles as we sat in a circle around the tarps. We “slept” on the bus again last night, getting to Amritsar around 6am this morning. It took us about a half hour to begin to move our limbs. I had to go to the bathroom, having neglected to get up during one of our numerous stops in the middle of the night, but I was skeptical about my chances at the public toilets a half a block away. Indeed, the women’s side was locked. Vandana J. from Pune called at 6:30am. 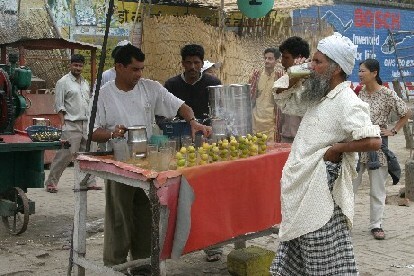 She had just arrived at the train station to join us for the rest of our postal delivery journey to Lahore. We picked Vandana up, and ran into Mr. Ramesh Yadev, President of the Folklore Research Academy, who had arranged our school visits and many other things for the duration of our stay in Amritsar, jogging in the early morning. Good thing too, because no one in the vicinity of where we were had any idea where Jagat Jyoti school was located, even though it turned out to be a few blocks from where we happened to have been parked. We were served a full breakfast after our presentation at Jagat Jyoti Senior Secondary School – stuffed kulchas (sort of like parathas, except baked in a tandoor instead of fried) with chana and and a fresh onion and coriander chutney. We were running late for Spring Dale School, but we had no choice but to eat. At Spring Dale, after our presentation in their multimedia room, a group of four girls came and asked respectfully: “Can you come for some snaps?” Sure, we can make time for some photographs… Or that is what my wishful thinking ears heard. What they actually said was: “Can you come for some snacks?” And we were ushered into a room with a table filled with platters of pizzas, sandwiches, chocolate cake, and coffee. And the girls saying: “Please have some sandwiches/pizza/chocolate cake/coffee” until we each had had a taste of every item! Atam Public School had the full assembly set up by the time we got there, with the little kids in front fidgeting in the hot sun. One little boy kept flicking the ear of his classmate, which the classmate (unbelievably) completely ignored. That evening, we made a brief stop at the Golden Temple, the most important sacred site for Sikhs in India. We arrived at Loveleen’s grandparent’s village in Kaithal district around 3am, after having taken a detour to pay state taxes for our vehicles in the middle of the night once we crossed into the state of Haryana. We travel at an average “speed” of around 40 kilometers an hour on the highways (much less in the cities) because our expediter and drivers will not look at maps (perhaps they don’t know how to read them) and never know where they are going. Their M.O. (method of operation) is to stop as often as they need to ask for directions – a losing proposition in a country where most people cannot tell you which direction is North (even from their own homes). Loveleen’s family puts us up for the night and feeds us the next morning before we start off for the village school – parathas with curd and butter made that morning. (The family started the day after putting us to bed!) The village is lovely. Quiet, clean, prosperous. We walk a few minutes to get to the school, which is on the other side of the tank. I notice many women of lower castes who cover their faces in the presence of unknown men. The kids of Nand Singh Wala Kheda Government School are assembled in the yard, sitting on empty plastic sacks that they carry to school for that purpose. Their books are carried in plastic bags. Our second school is located next to a Gurudwara about a 10 minute drive away. About 1,800 students were gathered in the grounds waiting for us. We didn’t have enough paper to go around (we didn’t expect the entire school to show up for our program), so we tried to get some of the little kids to play games. It was a pretty hard task since they were clearly not used to being encouraged to run around and have fun! 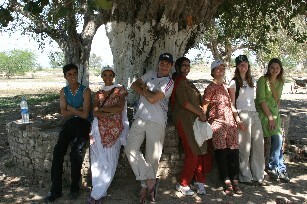 We left the idylic countryside reluctantly, knowing we had to get to Amritsar for three school visits, the first one at 7:45am! Subashbhai, our bus driver, woke everyone up at 7am, but we didn’t get on the road until after 8am, after everyone had finished washing up at the HP gas station where we had stopped the night before. 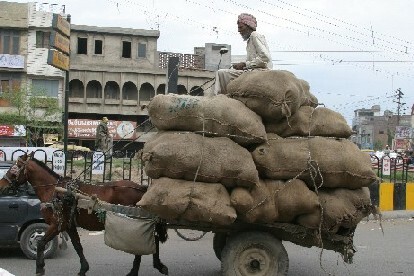 The night before that, we had overpaid for a fleabag hotel in Jodhpur, so figured that the bus would be an improvement. We were wrong. 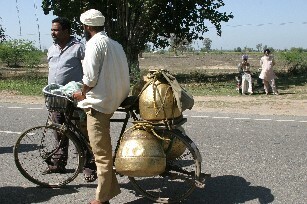 We had 40 kilometers to go to Jaipur and some 250 kilometers more to Delhi. 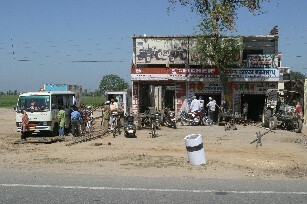 We stopped once for tea, then kept driving thinking that we would stop for food at the next destination, Gurgaon. We expected to reach Gurgaon by 2pm, but didn’t get there until around 3:30pm. Before we got to the Limca Book of Records building, John got an urgent message from Jayeshbhai and Babubhai, saying that Mark (who was already in Delhi) had not shown up, he wasn’t reachable, and that they were waiting for us at Didi’s (Nirmala Deshpande’s). 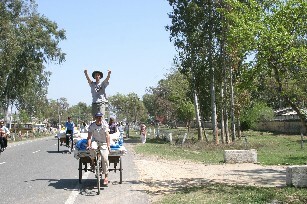 John hopped into one of the trucks and headed directly to Delhi while the rest of us headed to the Limca Book of Records office. John’s truck was stopped 4 times along the way, but each time, he got out of paying a fine for having a truck without the requisite “advertising” permits. He didn’t reach Didi’s until around 5:30pm. Final measurements will be taken in Pakistan. 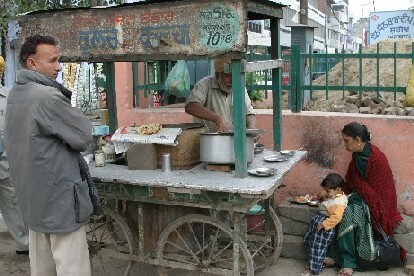 We “char ben” headed to Delhi, stopping for tea once again for the drivers, none of whom had eaten all day. 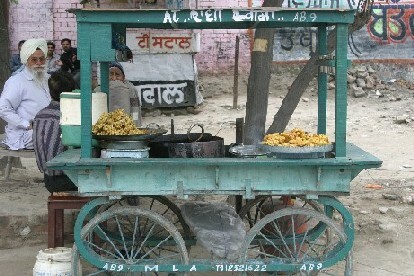 (We hadn’t eaten either, but had snacked on fruit and biscuits, which the drivers won’t touch – they need their chapattis and chawal.) 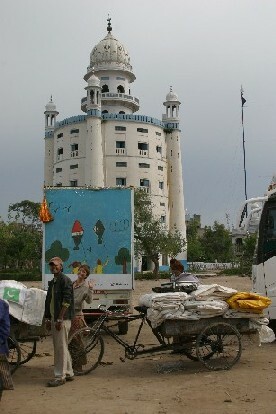 We headed for Pahar Ganj, looking for a cheap hotel as a default until we figured out where we would all be staying. We had spend half an hour crawling through two lanes in Pahar Ganj when it started to hail – huge pieces bigger than a half inch in diameter – and rain, with lightening and thunder, when we got a message from John saying that we could stay with Didi, and that the trucks could be parked at the Gandhi Ashram. So we backtracked, much to the fury of Subashbhai, who had been cursing us for having taken him down the narrow alleys of Pahar Ganj in the first place, and after a few wrong turns, found Mark at the entrance to Didi’s, directing us in. Mark and I rushed off to Habitat Center, where Arshiya Sethi, our host, was having an opening to a photography/art exhibit, while the rest of the group stayed at Didi’s with Jayeshbhai. Jayeshbhai had traveled to Delhi for the express purpose of facilitating our interactions with Didi, who is now a Member of Parliament, and a member of the India-Pakistan Peace Commission. Shampa Batabyal, Baruna Dutta, and Tora Saikia arranged for us to go to a school funded by the Central government (Rs. 100/student/month) and an organization that UNNATI supports – a school primarily for working children rescued from the stone quarries around Jodhpur. The local NGO is called Jai Bheem Vikas Shikshan Sansthan Shergarh. The school is Bal Shemic Vishesh School in Dhabbu Basti, Pratab Nagar. The school is located up on the side of a hill, and most of us are breathing hard by the time we climb all the steps. There are a handful of children and three teachers when we enter the classroom, made entirely of stone. More and more children rush in and many of the adults in the community also come and sit in the back. Two children, a boy and a girl, are made to sing for us. They stand in front, facing the children, with their arms at attention, as most kids are made to stand whenever they address anyone. Then another girl is made to join the two, the boy having to be dragged up again after he had already sat in his appointed place. More and more kids came in, one or two at a time. We were told that there were 30 “students” in the school, but by the end of our session, we had close to 40 kids in the room. Attempts to interview two children separately failed because there was always too much background noise, and at least one adult on hand to tell the kids what to say. We invariably have to insist that smaller children be allowed to participate because the teachers claim that they don’t know anything, and should not even be given a piece of paper, let alone crayons.